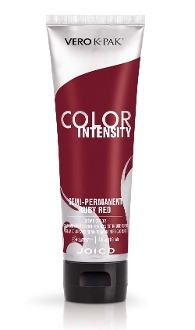 Joico Vero K-PAK Color Intensity Color System gives haircolor pros the power to create vivid, on-trend, insanely intense shades. This intermixable palette of semi-permanents includes the three new shades—Red, Yellow and Orange—plus supporting shades of Blue, Magenta, Purple, Green, along with a Clear Mixer, so that it's possible to create any hue, shade and nuance. Extremely concentrated pigments allow for exceptionally vibrant haircolor results. Reconstructs as you color with K-PAK’s exclusive Quadramine Complex to leave hair in superb, shiny condition. Copyright © 2018-2019 Lilybelle Locks. All rights reserved.